Tiny flower girl dress of Ruffle Fabric: Tutorial! You've got to check out this amazingly fun and easy project I just did for our flower girl at the wedding in a couple of weeks. 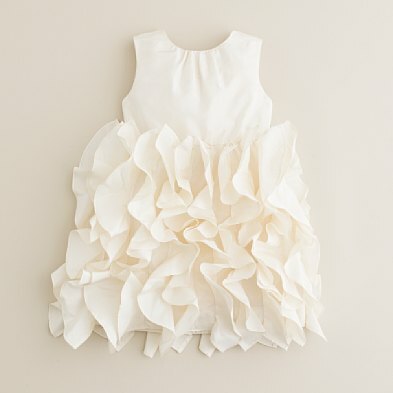 I only recently discovered Ruffle Fabric, this great site with tons of cute already-ruffled fabric in many colors and types, and it was perfect for the flower girl's dress! So happy to have them as a sponsor! 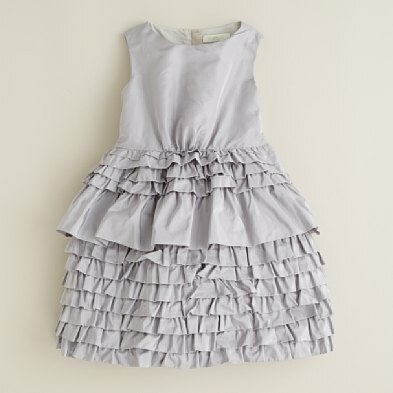 They have all kinds of choices but I went with lavender my 2-year-old flower girl's dress. Inspired by fancy girl's dresses on J.Crew Crewcuts and other stylish kid companies, I thought it would be fun to do a ruffled skirt and a smooth bodice of a contrast fabric. It was amazing how easy this dress was to make--maybe it's because I don't often make children's clothes (pretty much never) and, um, they go together way faster than clothes for me! Duh. And the fit is less critical since children are little barrels with limbs and their clothes don't need to fit like a glove. Anyway, want a tutorial for how to use this great ruffle fabric for a little girl's fancy dress? Here goes! I used a regular pattern for the bodice, Simplicity 2430. I wanted something a little 50's vintage-ey as well as cool and classy J.Crew-ey, so I gave her puff sleeves. Cut out the bodice and get your piece of ruffle fabric. Depending on the height of the child, you'll probably only need about 1/3 of a yard! Okay, now you have all your pieces cut out. Assemble the bodice as you would any other dress. Leave the back open and don't install your zipper or buttons yet. Pin right sides together the selvages of the fabric, aligning your ruffles so they all lay pointing down. Starting 4-5" down, sew together. There's no real need to press that center back seam you just made open or to one side, since it's a stretch fabric and will do what it wants anyway. Now, along the top edge of the skirt (the one with the 4-5" opening), run a long stitch with tight tension and gather the skirt. Right sides together, pin your gathered skirt to the bodice. I like to try to match the center front of the skirt (as it lays flat, using the center front of the bottom of the skirt as a guide) to the center front of the dress so you know your gathering is even all around. Again you don't really need to press since the woven nature of the bodice will dominate the loosely woven knit of the top of the ruffle fabric, so your seam allowance should point down toward the skirt. Now, install your zipper or other closure as you would any dress. To match my silk flowers and everything, and to give it some more detail, I made a silk flower for the waist of the dress and sewed it to a pin back. Then I pinned it to the waist of the dress--hope it's in the right place, but we can move it around or take it off and put a sash or something on it for another occasion later! Easter, maybe? Seriously, this took me like an hour. So fast and easy! And cute. Check out Ruffle Fabric and look at all the cute colors and ideas there... great idea for a quick and simple project! That is adorable! Great use of ruffle fabric! 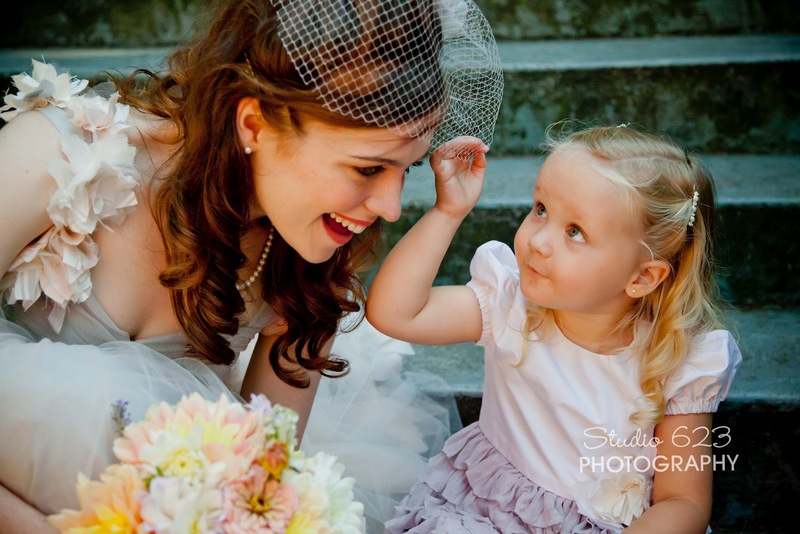 Your flower girl is going to look soooo puuuurrrty! I really like this dress, and it does not look like it only took you an hour to make! Awww how lovely. I saw this exact fabric here in my local fabric store (im in the UK) and thought how lovely it was. My daughter loves ruffle/rah-rah skirts so I best get making!! Really cute dress! I love making kid's clothes bc it's so much faster and easier! I always opt to make stuff for my daughter over me! I absolutely love this! I want one! Ooooh you should totally sell these, I would buy them for my flower girls!!! !